Froome the new king at Sky? Chris Froome’s win in last weeks Criterium du Dauphine capped what has been a (so far) successful 2013 season, coming on top of victories in Oman, the Criterium International and the Tour de Romandie. He was backed up in France again by Richie Porte who finished second to Froome for the second time this year. Porte is a shoe in for Team Sky’s Tour squad while the most notable omission will be erstwhile team leader Bradley Wiggins. Wiggins had raised the stakes in the ‘who will lead at the Tour’ discussion that has been doing the rounds of traditional and social media since the start of the year with his Sunday Times interview prior to the Giro. At that point in time the suggestion that Wiggins was capable of riding both grand tours didn’t seem impossible and it took an official Sky press release to sooth the feelings within the Froome camp that he was still plan A for the Tour. Here at VCSE we had speculated that it would be Wiggins performances in the Giro that would determine whether or not he would lead or even appear at the Tour in July. His difficulties in Italy and eventual withdrawal increased the likelihood that he would ride in France, but once again the noises emanating from the Sky Death Star appeared to pour cold water on any chance of him leading the team ahead of Froome. All of which led to the announcement from Sky last week that Wiggins would not race the Tour due to a previously unreported knee injury. Taken at face value, any injury that prevents a rider training is reason enough for Wiggins withdrawal, but it seems highly coincidental that the ‘Wiggo Knee’ was revealed just as the Sky leadership question was peaking again. Might a possible other explanation be that the aforementioned knee be a convenient smoke screen to allow Wiggins to save face at not being able to lead Sky at the Tour? Wiggins has kept a low profile since leaving the Giro (although he has popped up in fan’s photos taken around his Lancashire home). Froome meanwhile has the air of someone who is following a long standing plan; he’s reconnoitering Tour stages this week. VCSE suspects that the discussion about Wiggins riding the Tour was a short one. While he isn’t as strong a climber as Froome he is capable of providing the kind of support that a Kiryenka or Suitsou provides on a stage, riding a lengthy stint at the head of the peloton at high speed. The problem for Sky is that Wiggins clearly has no intention of surrendering his team leader role and therefore they have had to finesse an outcome that allows Froome to lead while Wiggins saves face. In the longer term the story probably has not gone away. There have already been stories linking Froome to BMC where he could be a perfect replacement for Cadel Evans. Whether Sky will let Froome go, particularly if he has won the Tour is something else entirely. Can Froome and Wiggins peacefully co-exist in the same team? Possibly, although that would probably involve Wiggins receiving 100% support for another tilt at the Tour in 2014. Another possibility would be for Sky to develop Wiggins into a classics rider. He ‘gets’ how races like Paris Roubaix fit into cycling culture and could benefit from being able to add some weight to attack one day races. Could Wiggins leave Sky? 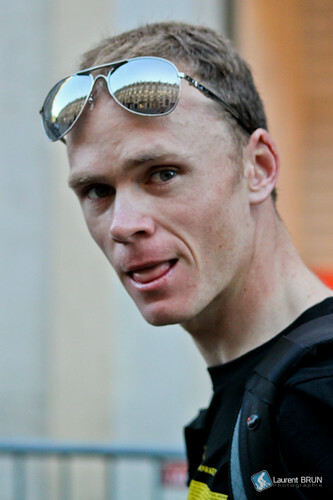 Anything is possible and VCSE suspects that they would rather retain Froome. In which case might Wiggins end up back in the arms of Garmin? So Froome reigns supreme at Sky and at this point its hard to see past him as the winner of this years Tour. Of his rivals at the Dauphine, Alberto Contador ended up riding in support of Mick Rogers after a crash and poor showing in the time trial. Joaquin Rodriguez is focused on the Tour this year, but wasn’t able to bring much to the Dauphine. Cadel Evans is a contender assuming he hasn’t left his legs at the Giro. The match up fans really would have wanted won’t happen unfortunately and we’re not talking about Froome v Wiggins (again). No the showdown that isn’t at the Tour would have been Froome verses Nibali. He is possibly the one rider who could make the 2013 Tour de France something other that a Sky show this year. That match up, like Wiggins hopeful return to form, is something we will just have to wait for.